President Maduro during the televised press conference February 14, 2015. February 12, 2015 -- TeleSur English, posted at Links International Journal of Socialist Renewal -- A coup plot against Venezuela's government has been foiled, with both civilians and members of the military detained, President Nicolas Maduro revealed on February 12 in a televised address. 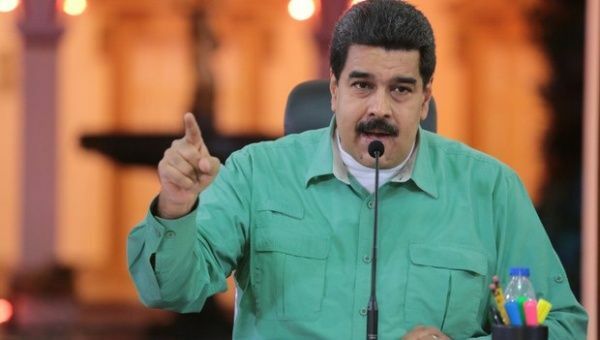 Those involved were being paid in US dollars, and one of the suspects had been granted a visa to enter the United States should the plot fail, Maduro said. Venezuela’s president stated that the coup plotters already had a “transitional” government and program lined up once the plan, which included bombings on the Miraflores [presidential] Palace and the teleSUR offices in Caracas, as well as assassinations of members of the opposition, Maduro and others, was carried out. Maduro explained that a video of masked military officials speaking out against the government had been recorded, which was set to be released after the planned assassination was carried out. Venezuela's minister of defence Vladimir Padrino Lopez stated via his Twitter account that the armed forces remain loyal to the constitutional government. “The Bolivarian National Armed Forces remain resolute in their democratic beliefs and reject coup schemes that threaten the peace of the republic”, said Padrino. According to Maduro, one of the suspects was already under surveillance and had been suspected of plotting against the government during last year's violent demonstrations, but was not charged. Nevertheless, he continued plotting against the democratically elected government. The four-stage plan involved creating an economic assault on the country, creating an international debate around a supposed humanitarian crisis, a political coup involving officials who would turn on the government, and finally a military coup that would lead to the installation of the transitional government. Maduro stated that the plot, which was scheduled to coincide with anti-government demonstrations planned for the one-year anniversary of the start of violent, opposition-led demonstrations that began on February 12, 2014, was uncovered after military officials who had been approached to participate reported the schemes to authorities. Maduro called on the Venezuelan people to be on alert and prepared to maintain peace in the country in the face of continued attempts by sectors of the right wing who seek to overthrow the democratically-elected government. February 13, 2015 -- TeleSur English, posted at Links International Journal of Socialist Renewal -- Venezuelan National Assembly head Diosdado Cabello revealed the details February 12 of what the government says was a “thwarted coup”. His public announcement followed one earlier by President Nicolas Maduro. Cabello and Maduro said the plan was financed from the US and was to be carried out early Thursday February 12 during the anniversary of the start of the violent opposition blockades last year and marches today by the country’s youth. People were allegedly going to be killed during the marches, while strategic targets would have been bombed in an attempt to overthrow the Maduro government. Cabello said it was important to inform the people of the plans and names of people involved in the attempt, which he said included a small group of civilians and air force officials. He said that thanks to the actions of state security and intelligence officials, various people and their equipment were detained and confiscated, including a computer with the “tactical objectives of the coup group”. 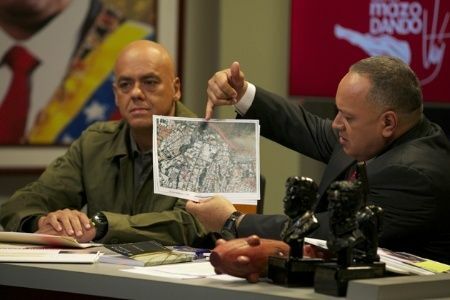 Cabello showed a map, which he explained came from that computer, that had various buildings marked as “tactical objectives”, including the Miraflores Palace, the justice ministry, the teleSUR building, the National Electoral Council (CNE) and the military intelligence headquarters. Cabello said that authorities had confiscated grenades, military and Sebin (intelligence) uniforms, an eight-minute video with a declaration by the plotters and a collection of AR-15 rifles. Widely available in the United States, the AR-15 was first developed for the US military, but is today one of the most popular rifles commercially available in the United States. It is not legally available to the public in Venezuela. The AR-15 has been used in a number of mass shootings in the United States, including the 2012 Aurora shooting, which left 12 people dead in Colorado. The coup attempt was going to start with a public announcement that Borges and opposition political leader Antonio Ledezma were going to sign, and it was going to be published by a national media, Cabello claimed. He added that a Tucano plane was going to conduct the airstrikes. ​Various air force officers have been detained, for their alleged involvement in the plot. Cabello argued that the opposition was organising legal activities, such as collecting signatures, while at the same time “secretly planning a coup”. He also showed a photo and alleged that a US official recently visited Venezuela to observe the trial of Leopoldo Lopez, who is accused of having incited last year’s opposition violence, which led to 43 deaths. “What right does a US official have to attend (the trial)?”, asked Rodriguez. February 15, 2015 -- TeleSur English, posted at Links International Journal of Socialist Renewal -- In a televised address on Saturday night, February 14, Venezuela's president Nicolas Maduro revealed new information on the foiled coup attempt against his government, including accusations that the country’s opposition leaders were aware of the plans. “Almost all of the MUD [right-wing opposition] leaders knew about this plan, this ambush, almost all of them, including the four-time losing candidate”, said the Venezuelan leader, referring to opposition presidential candidate Henrique Capriles Radonski. “I'm not saying all of them were actively involved. But it was a rumour circulating among them, that something was about to happen”, Maduro explained. Maduro also said that those detained have confessed to the plot and have provided new information that authorities are investigating. In addition to attempting to bribe officials and politicians with cash and visas to enter the United States, Venezuela's president expanded on the role played by the US embassy in the country, saying that the script read by coup plotters in a video they planned to air was crafted by an advisor at the embassy. Maduro called on US President Barack Obama to stop his officials from meddling in Venezuela's affairs. “In your name, they are organising coup plots against a democratically elected government”, Maduro said. According to Venezuelan intelligence and testimonies, the coup was set have taken place on February 12, one day after opposition leaders Leopoldo Lopez, Maria Corina Machada and Antonio Ledezma published a “Transition” program, which outlined measures including the privatisation of oil, deregulation of the economy and agreements with International Monetary Fund. The plan included targetted assassinations and bombing a series of targets – including teleSUR's headquarters in Caracas – while opposition activists staged violent protests in the streets to mark one year since the start of opposition-led protests that claimed 43 lives.